Photo illustration by Ryan Angel Meza. It’s the end of final exams and now the journey from City College’s Business Building to the parking lot begins. Relaxation in front of the TV with a game controller in hand is within reach. When suddenly, a giant alien beast jumps from atop the City College library, pounds its chest and proceeds to spew a green, liquidy substance out of its tentacle-encrusted mouth. Covered in the ooze, you find yourself drained of ten points but quickly get back to your feet again, pick up the weapon that just happens to be sitting in the center of the quad, grab a health packet and mash the trigger as fast as possible. After a hard-fought battle, victory is finally yours. As you tuck your massive weapon into your T-shirt, you hear someone call out your name.The next thing you know, you realize you’re back in the classroom and that the person saying your name is your business management professor telling you to finish his final exam. As you continue filling in random answers on a Scantron, it occurs to you that studying for that test would have been a better choice than staying up late shooting zombies in the face. For gamers who are students, this is an all-too familiar experience. In the past 10 years, video games have evolved from being part of a niche market into a multimillion dollar industry. The success of systems, such as the Sony PlayStation 3,Microsoft Xbox 360 and Nintendo Wii prove that console gaming is still alive and kicking.However, mobile devices, smart phones, tablet computers and technological advancements, such as touch screens and motion controls have also changed gaming from the at-home kid’s hobby of yesteryear to an on-the-go experience that just about everyone enjoys. In today’s world, even grandma is a gamer. 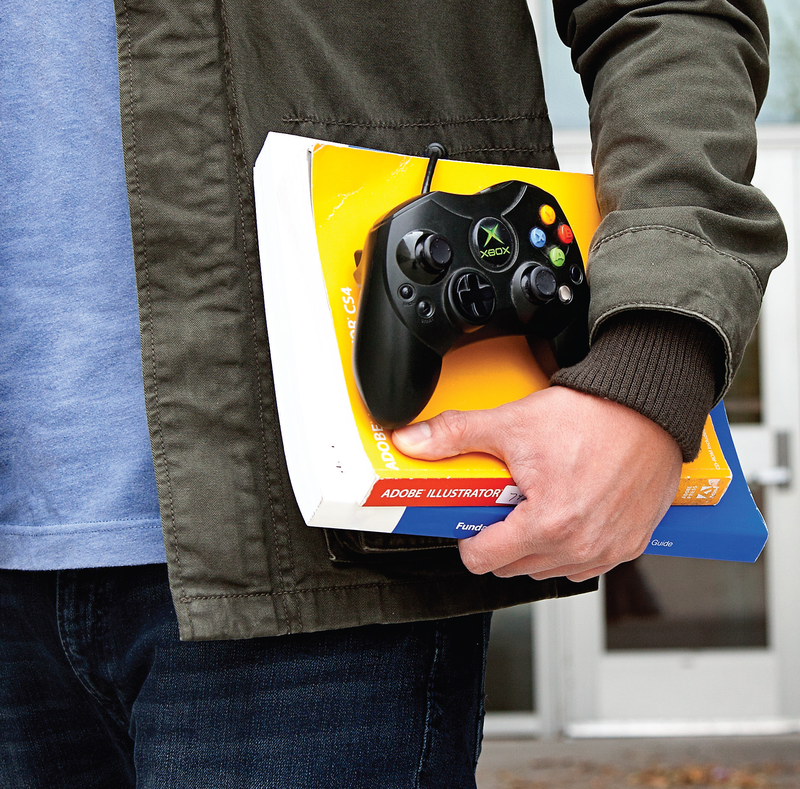 With so many ways to play, gaming can be a huge distraction—especially for students. When it comes to balancing school work with any hobby,it often seems as if there just isn’t enough time in the day. Finding the balance between work and play is a tough foe to defeat, but at City College, gamers are finding ways. The school’s Advanced Technology Department has offered a three-course video game design program since 2008. In the program,students learn what makes a game fun (or not so-fun) and how to create simple 3D design with a software program that uses many of the tools used in the gaming industry. By the end of the program, students are able to create their own games. Patrick Crandley, a graphic communications professor who teaches game design at City College says that taking these courses is a great way to combine a passion for gaming with school work. Taking Crandley’s classes can send students well on their way to being able to develop and publish their own games, even without the backing of a software or video game company.A prime example of potential success an independent developer can achieve is the popular game “Angry Birds.” Though the concept of the game is simple, it has sold millions across various platforms and has become a retail sensation with T-shirts, stuffed animals, toys and even a board game adaptation. Yes, a board game based on a video game—now that’s success. But even if you prefer playing games to making them, there are many options for finding the balance you seek. The adventure begins with finding which option works best. “Budget time in your life,” says Crandley. “I tell myself this, and I have to do this, I mark out very specific times in my day, and for me, since I’m really busy during my week, I’m allowed to play two hours of “Gears of War 3” on Friday evenings after I’ve done X, Y, and Z but if I budget an hour, I only play for an hour.”Another tipis to use your hobby of choice as a reward for accomplishing your daily or weekly goals. “If I do all the things I’m supposed to do that day,then I reward myself with some gaming,”Crandley says. Nick Williams also works hard to find that balance. Williams is a City College 3D animation major with a focus on environment art for video games. He has already completed all of Crandley’s courses. Williams says maintaining equilibrium between work and play is all about finding the right amount of time for each aspect of your life. Taking game design courses at City College or scheduling your hobbies into your extremely busy life are just two solutions to a problem familiar to many students. “The important thing that people tend to forget is that video games at their core are entertainment so we should treat them like any other form of entertainment,” says Crandley. Whether you’re into shooting other players in games such as “Call of Duty” or you’re a casual gamer who enjoys a few rounds of “Angry Birds,”the bottom line for gamers is clearly to find the way to a strong balance between work and play.It doesn’t matter if it’s gaming, movies, music,social activities or any other hobbies that tend to keep students from focusing on school—balance is the key to success. This entry was posted in Features, Mainline and tagged college, Crandley, gamers, mainline, Microsoft Xbox 360, nintendo wii, play, professors, SAC, sacramento, sony playstation 3, time, video games, work. Bookmark the permalink.